The truth about E-mini S&P tick charts changes as of October 4th! 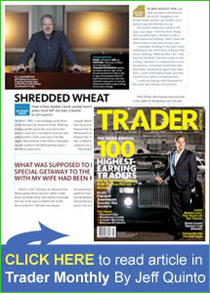 Jeff Quinto has been called "America's Preeminent Futures Trading Mentor". Jeff is a 40-year veteran futures trader, former CME member and a world-class trading coach. He has coached hundreds of futures traders, including traders from Hong Kong, France, China, England, Australia, the US and Canada. Jeff strongly believes that professional traders are world-class competitors, comparable to professional golfers, top tennis players, and Olympic athletes. None of these competitors could have achieved their top-ranked status without first having a world-class coach. Jeff is that world-class coach for futures traders. Getting Started: Building a Sound Foundation for Your Trading Career from the CME. Click on Jeff to see each video. Trading futures contracts may not be suitable for all investors. You may lose a substantial amount of money in a very short period of time. The amount you may lose is potentially unlimited and can exceed the amount you originally deposit with your broker. This is because trading is highly leveraged, with a relatively small amount of money used to establish a position in assets having a much greater value. If you are uncomfortable with this level of risk, you should not trade these contracts. For a more detailed explanation of the risk from futures and options trading click here. The author or any personnel associated with aforementioned makes no warranties of any kind, expressed, implied or statutory concerning the data or information provided on the following Web Pages. The opinions expressed in these webpages are the opinions of the author and do not necesssarily represent the opinions of any other entity.